Eatonton-Putnam County offers new and expanding businesses a healthy, economic landscape supported by a business-friendly environment. 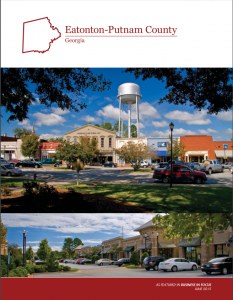 Putnam County has earned the designation of an Entrepreneurial Friendly Community by the State of Georgia, a recognition which is designed to facilitate small businesses in reaching their potential. Eatonton-Putnam County has grown from an agrarian past into a broader business climate to include manufacturing, tourism and retail. Our community offers a prime location which combines business and quality of life, with diversification being key to Putnam’s sustained growth patterns. Our community maintains a thriving downtown shopping district which lends support to the two industrial parks located within the city limits of Eatonton and a third privately owned one close to Lake Oconee. Additional retail, dining and lodging options are located throughout Putnam County from Lake Sinclair to Lake Oconee. Putnam County’s strong economic profile is a result of our down home quality of life, proud residents that call Putnam home, strong business community, quality workforce, advanced utilities, convenient means of transportation and enticing incentives with financial advantages.